Many of us feel called to respond to the ecological destruction of our planet, yet we feel overwhelmed, immobilized, and unable to deal realistically with the threats to life on Earth. Noted spiritual and environmental thinkers Joanna Macy and Molly Young Brown contend that this crippling response to world crisis is a psychological defense mechanism that has been endemic since the years of the Cold War arms race, when we had to adapt within a single generation to the horrific possibility of nuclear holocaust. 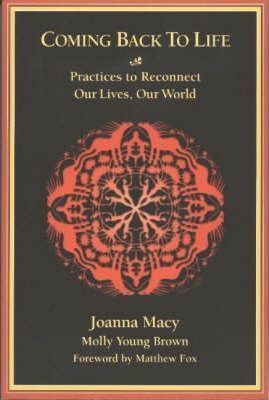 Since its publication in 1983, Joanna Macy's book, Despair and Personal Power in the Nuclear Age has sold nearly 30,000 copies and has been the primary resource for groups of men and women confronting the challenging realities of our time without succumbing to paralysis or panic. Coming Back to Life provides a much needed update and expansion of this pioneering work. At the interface between spiritual breakthrough and social action, Coming Back to Life is eloquent and compelling as well as being an inspiring and practical guide. Joanna Macy is a teacher and tireless workshop leader from Berkeley, California.